One of the benefits of the Chancellor’s Scholars Program is the opportunity to take part in a research or internship opportunity. 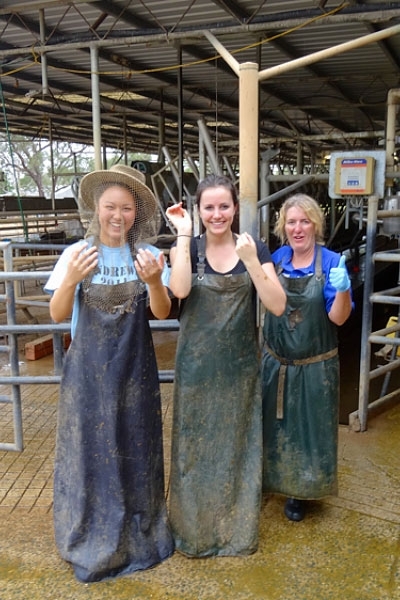 For Bachelor of Biomedicine Chancellor’s Scholars, this includes the Rural Volunteering program in which select students travel in pairs to a small rural/regional towns and take part in a myriad of volunteering activities. "The aspect that I found most valuable about the Chancellor’s Scholars Program was not, however, the promise of a place in a postgraduate degree of choice, but rather the opportunity that it gave me to experience healthcare in action. Under the Biomedicine Chancellors’ Scholars Rural Volunteering Program, I got the chance to undertake a clinical placement in the rural town of Echuca at the end of my first year of Biomedicine. The placement brought me into close contact with doctors at Echuca Regional Health, and afforded me the tremendous privilege of witnessing life as a clinician. As a doctor, you are given the unique honour of being involved in some of the most fateful moments in the lives of patients. Over the course of two weeks, I saw doctors being asked to assist in decisions not only about treatment, but also about starting a family, making the final will, reconciling with an errant child. Such exchanges consolidated my will to become a doctor, one of very few professions which allow you to witness the human condition up close, at its most vulnerable, and to be of practical help." Facilitating a strong sense of community awareness and engagement. Supporting a broader understanding of rural health care. Further detailed objectives could depend on the specific placement activities eg. Learn about normal development of children through helping them read/play; Learn what services are available in rural communities to help the elderly. Health experience – time with paramedics, GPs, school nurses, pathologists. These activities would be purely observing. Students will be required to complete the online expression of interest form by Sunday 27th May 2018. Places will be allocated based on your explanation as to why you would like to do a rural placement and what you hope to get out of it. Please note: Preference is given to current third years who have not previously undertaken this Rural Program.